"Most of my competitions are during the summer which involves me travelling around the country most weekends to get the scores I need to qualify for England and GB." 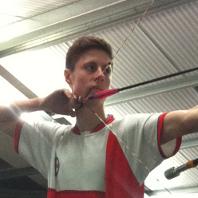 Alex shoots in the compound bow discipline for Derwent Bowme and is a member of the GB Youth Development Squad and East Midlands Archery Squad. He is currently the international junior champion, East Midlands champion and Derbyshire Champion. He is also a member of the Derbyshire Sport ICON supported athlete programme and is currently training for a competition in France in the New Year ahead of the world trials in Romania next summer. “Part of my training involves strength and conditioning and I am able to do much of this at College as part of my Uniformed Public Services course which involves a lot of physical activity. Find out about studying Public Services at Derby College.